It appears we may be on the verge of a new silent spring, a season marked, not by the absence of birdsong, but by the lack of insect buzzing. A range of flying invertebrates—from the iconic monarch butterfly, to moths you’ve never heard of, to a number of once-common bumblebees—are suffering significant declines. Some biologists are warning that the losses could have serious consequences for the food web and for human agriculture, especially since native pollinators are far more important for food crop pollination than the domesticated European honeybee. No doubt you’ve heard the buzz by now: Honeybees (Apis mellifera) are in serious trouble. In 2005, beekeepers in Europe and North America started to report worrisome declines in their hives, sometimes with annual loses exceeding 50 percent. The epidemic, dubbed Colony Collapse Disorder (or CCD), sparked a race to figure out the cause, or causes, of the die-offs. Suspicion swirled around the varroa mite (a pest that had long plagued honeybees); poor bee nutrition due to a limited diet from monocrop agriculture; and a new class of pesticides called neonicotinoids, which European regulators have since temporarily banned. The plight of the honeybee has become a cause célèbre. This summer, TIME put the bee on its cover and warned: “Eliminate the honeybee and agriculture would be greatly diminished.” Whole Foods launched a public education campaign—which quickly went viral—showing what the produce section of the grocery store would look like without the aid of the honeybee: Out of the 425 items in the produce area, 237 vanished from the picture when honeybees are removed from the agricultural equation. All of this attention on the honeybee’s poor health is important because it’s an opportunity to illustrate our utter reliance on other creatures. But often lost amid the honeybee anxiety is a much bigger story: The decline of native bumblebees, butterflies and moths, which are even more important for pollination. Several butterfly species are in real trouble. In June, the U.S. Fish and Wildlife Service declared that two Florida butterflies—the rockland grass skipper (Hesperia meskei pinocayo) and the Zestos skipper (Epargyreus zestos Oberon)—are likely extinct. 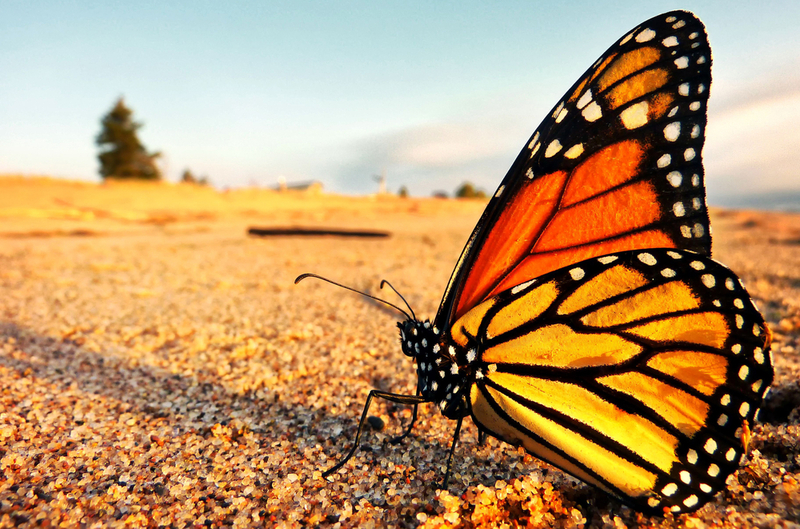 The iconic monarch butterfly (Danaus plexippus) seems cursed to follow its Florida cousins. The most recent census of monarchs, taken at their winter grounds in Mexico, found the species has declined by 59 percent from the previous year. Several species of native bumblebees are also suffering. Franklin’s bumblebee (Bombus franklini), a bee native to Southern Oregon and Northern California, is likely extinct. The rusty-patched bumblebee (Bombus affinis) is on the verge of disappearing. Once common across eastern North America, its range has shrunk by 90 percent. The Xerces Society has filed a petition with the federal government to have it listed as an endangered species. The rollcall of threatened bumblebees goes on. The yellow-banded bumblebee (Bombus terricola) used to be found throughout the Northeast and Upper Midwest, but has disappeared from much of its range. At one time the Western bumblebee (Bombus occidentalis) could be spotted from the Rocky Mountains to the Pacific Ocean and was reared commercially to pollinate greenhouse tomatoes and cranberries, as well as blueberries, apples, and cherries. Today the Western bumblebee has can no longer be found in its historic range from Southern British Columbia to Central California. What’s driving the loss of bumblebees and butterflies? As with the honeybee, pesticides are partly to blame. In a widely publicized episode that occurred in June, some 25,000 bumblebees were killed in Oregon after workers at a shopping mall sprayed trees with a pesticide called “Safari” designed to combat aphids. Usually, though, pesticide-related damage is less dramatic. According to the Xerces Society, pesticide spraying by the forestry industry (used to keep down insects that can harm trees) has depressed bumblebee numbers, contributing to a drop in blueberry pollination in the Northeast and Eastern Canada. Some burrowing bees can be harmed by pesticides sprayed on lawns. And neonicotinoids appear to be harming bumblebees just as they do honeybees, if not outright killing them, then at least compromising their cognitive abilities, including their navigation. Habitat loss is also an issue. Bumblebees thrive in highly diverse ecosystems, and monoculture agriculture has reduced their forage areas. Species that are found only in a few places are particularly vulnerable. Take the Karner blue, an endangered butterfly that is endemic to the Great Lakes. Its primary host plant is the wild lupine, which mostly grows in the region’s sand barrens, the very same sand barrens that are now at the center of a mining boom for the sand used in fracking. The monarch butterfly is suffering a similar double whammy as industrial agriculture has destroyed its host plant. The monarch larvae feeds almost exclusively on milkweed, which has disappeared across huge areas of the Midwest with the spread of glyphosate-tolerant, aka Roundup-Ready, corn and soybeans. According to one study, from 1999 to 2010 milkweed in the Midwest declined by 58 percent. “What I am concerned about is that Monsanto and these other companies that have these very powerful pesticides and genetically engineering crops, it’s destroying the milkweed habitat where the monarchs lay their eggs,” Brower says. In a study published earlier this year, researchers concluded that “wild insects pollinated crops more effectively” and “increase in their visitation enhanced fruit set by twice as much as an equivalent increase in honey bee visitation.” The main reason industrial agriculture has come to rely on the less efficient honeybee, Mader says, is because the honeybee is easy to control and move around in massive quantities. Our crop monocultures have bred their own insect monocultures. It’s not just humans’ food source that is at risk. Mader says that “probably 25 or more percent of the dietary sources of birds and mammals” are fruit or seeds that come from plants that require direct pollination. A diminishment of native pollinators could send a shudder through the food web. Fortunately, the decline of bumblebees and butterflies seems to be catching the public’s attention, especially the disappearance of the monarch butterfly. The monarch would seem to be a classic example of what you could call charismatic micro-fauna: a small creature with a big hold on popular imagination. The prospect of its extinction could serve as a wakeup call, forcing people to take action to stem the worldwide loss of biodiversity.